In this article we cover what I feel is the best LSAT study schedule based on my own experience and my observations as an LSAT tutor and LSAT class instructor. Here we discuss how long and how hard you need to study for the LSAT to max out your score on test day, as well as what to do and when you need to do it. The idea behind this study schedule is that you are doing everything you need to so you won’t worry that you’ve left anything on the table. Follow this schedule and taking the LSAT will feel automatic come test day. New To Lawschooli.com: Premium Day-by-Day LSAT Schedules! If you are looking for a more detailed schedule, we’ve just released a brand new day-by-day LSAT Prep Schedules for highly-motivated students. 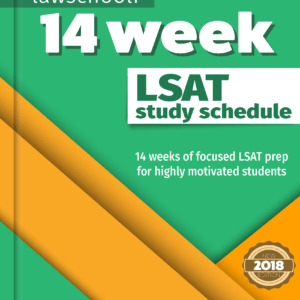 These premium LSAT study schedules are available in the following lengths: 10-week, 12-week (3-month), 14-week, & 16 week (4-month). These intense schedules walk you through the Powerscore Bibles & plenty of real LSAT preptests, ensuring that you’re making use of all the best study materials currently available in an efficient and effective way. So first, how long do you need to properly study for the LSAT? I believe that the optimal amount of time to study for the LSAT is approximately 3 months of intense LSAT preparation. Intense preparation means at least 3 hours per day, 5-6 days per week. To do the intense amount of study required to max out your LSAT score, you need a ton of fresh LSAT questions from real preptests. Redoing problems you have done before is of very limited value because your brain will just memorize the solutions. Having enough fresh questions so that you don’t run out is truly essential to properly prep for the LSAT. You are going to want to start by getting instructional materials. I tried almost all the stuff out there during my prep, and I’ve seen more as a tutor… but not matter how many new books come on the market, I continue to recommend Powerscore’s Bible Trilogy as the definitive source for LSAT Prep. You will also need plenty of real LSAT preptests, so we also rely heavily on the ‘Actual, Official LSAT Preptest’ series, each of which contains 10 real, previously administered LSATs from past years. When I took the LSAT in June 2008, a 3 month schedule gave me enough time to (almost) fully exhaust the LSAC released prep tests that were available at that time. All of these are included in the list above. There are a handful more available now, also included in the list. If you must study over a longer period than 3 months, make sure you pace it so you don’t run out of fresh questions. This LSAT schedule can be followed while working ~40 hours a week, but may have to be elongated by several weeks or even a month if you are working a lot of overtime. Step 1 (Day 1): Do a Cold Diagnostic using the first PT in The LSAT Superprep Your cold score might be painful, but quick like a band-aid do a test so you know what you are up against. Step 2 (Weeks 1-3): Start working through each of the Powerscore Bibles (LGB / LRB / RCB) and do untimed problems of the question type you are learning from The LSAT Superprep and the Bibles. I would start with the LG bible, then do the LR bible, then do the RC bible last. I advocate going through the Bibles kind of quickly on your first read and then returning to them throughout your prep as you encounter question types that give you trouble. Don’t obsess over whether you have memorized every point yet the first time through. Trust me, you’ll be able to practically recite passages from these books by the end of your prep. Also read through the instructional sections in the Superprep but remember that you want to stick with one method for diagramming, so learn and stick with Powerscore’s techniques from the Bibles. After you have finished the questions in the Superprep, move on to questions in 10 Actual, Official LSAT Preptests. Step 3 (Weeks 3-4): Continue working through the bibles. Now is the time to start experimenting with doing timed questions from remaining sections in your 10 Actual, Official LSAT Preptests. If you have finished this, move on to Next 10 Actual, Official LSAT Preptests. Start with timing individual questions for logical reasoning (1.5 mins each) and individual games and reading comp passages (about 8 minutes 45 seconds each). For now, don’t stop doing a question or passage if you pass the time, just note that you have gone over and finish it up. Once you start to get a feel for timing quickly move on (around the end of week 4) to doing whole timed sections. Step 4 (Week 5): As the mid-point of your LSAT prep schedule approaches, you should begin doing full timed sections regularly. It is okay to mix in some practice on individual questions as well. When doing timed sections, begin stringing sections together to begin building endurance. Around now, do a full simulated test using a fifth section borrowed from one of the older preptests that you have not done. It’s okay to take your score from the best four sections. Hopefully you have already seen big improvements from your cold diagnostic. 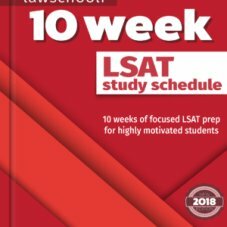 Step 5 (~Week 6-Week 10): At this point is your LSAT study it’s time to take stock of how much material you have remaining and schedule your remaining prep. From here on out, the lion share of your study consists of simply doing timed sections and going over the answers to understand any that may have given you trouble. Schedule it out so you can do 3-4 full preptests a week the next 4 weeks. Do these every other day and review your answers. You can also start experimenting with fully simulating the test conditions on these tests. These full length test will mostly cover what you do on heavy study days. On in-between day (lighter study days), do more sections and careful review. On my typical in-between day, I would do 2-3 sections with rest and review after each section. Pull these sections from older tests. On these in between days, load up on more sections of whatever section type (LR/LG/RC) is giving you the most trouble. Also make sure to take a full day off from study each week. Step 6 (Week 10-12): In the final two weeks of your schedule you should be doing a full preptest worth of material most days. Still take a day off every week. Every other day, try to fully simulate LSAT test conditions. Do this by by doing three sections in a row, taking a break, then doing two more (to get the fifth section use one from an older preptest). Continue going over questions you got wrong or struggled with. It is critical in this period that you begin working forward through the most recent preptests- those from 10 New Actual, Official LSAT Preptests and also the recent individually published tests. Step 7: Keep following step 6. However, the final week is special because while you are prepping intensely, your focus should be on staying healthy and happy. This means eating right, sleeping enough, and doing exercise or whatever help keeps you happy. See this post on What to Do The Week Before The LSAT for detailed advice on managing the final week. A ‘cold diagnostic’ is a simulated LSAT test that you take before beginning your actual prep so you can see where you stand. A diagnostic LSAT test won’t have much value for learning how to do the LSAT, but I recommend it anyway. Why? Because it gives you a great benchmark to see how you are progressing as your prep moves forward. Just don’t be worried if your score is a little horrifying. Everyone scores far below their potential on their first test. The cold diagnostic is just for reference point and something you’ll be able to laugh about after you finally crush the LSAT! I argue for being flexible here. Some days you will have a lot of juice in the tank and can study a lot. Other days you are just too tired and its not worth it. If you are having fun doing it and it doesn’t feel bad, then study for 6+ hours if you want to. Most days, you want to do at least 3 hours of study. I used to alternate heavy and lighter days of test prep which I think helped combat burnout. So perhaps Monday, Wednesday, Friday I would do about 4-5 hours of prep. Tuesday and Thursday I would do 2-3 hours. Either Saturday or Sunday I would hardly do anything at all. The other weekend day I would make a big study day. The big thing is to avoid over-studying or under-studying. Invert the above schedule so more days are easy days if on a particular week you are feeling burnt out. Also, it is possible to have a full-time job while doing this prep so don’t worry that you can’t prep fully while handling work! See my discussion of balancing work and study here. The cold diagnostic is the only part of your prep that you want to be doing totally cold. After that, you want to start learning how to do LSAT questions from various instruction materials. Doing LSAT questions well requires that you develop a consistent system for diagramming problems that contain formal logic, especially on the logic games section. I wasted a lot of time choosing between systems in various books. Learn from my mistakes and choose one quickly, because switching systems causes a major setback in your prep schedule. For a longer discussion of the best LSAT prep materials check out my article on general LSAT strategy: LSAT Prep Books and Self-Study- How I Got a 177 on The LSAT. In the first 1-3 weeks of your LSAT study schedule you are going to want to be doing mostly un-timed prep questions. Dabble in all 3 question types, so that you know where your weaknesses are, and drill that kind of questions more than the others. The goal at this stage of the game is to get almost all of the questions right even if it takes a long time. Speed will start to build naturally. When a certain kind of question isn’t going right, head immediately back to your prep books and see what they say on doing that question type. Logic games tends to give people the most problems at first. Don’t worry, it’s also the easiest section to see huge improvements on as you hammer it throughout your schedule. When you are hitting a wall seek out advice on the question types giving you problems or better yet just ask me in the comments. As a tutor I pretty much dealt with everything so I should have an answer. Somewhere around week 4 is when you start doing some full timed sections, giving yourself the standard 35 minutes to do a section. Early into your LSAT study schedule results may be mixed at first so don’t stress. Take a break between each section and review problems you got wrong and hard ones that you got right. If you feel that you are struggling heavily with the timing of full sections, drop back some of the time and mix in timed individual LCR questions, games, and reading comp passages doing them the way you did in Step 2, which is noting the time but finishing the questions when you go over. It’s still okay to do some wholly untimed practice occasionally throughout the rest of your prep, especially on question types you are struggling with. Don’t worry about doing multiple timed sections back to back with no breaks just yet- build your stamina later. Now is the time to teach your brain how to do the problems the best it can under ideal conditions. Take nice little 5-10 minute breathers between sections. Don’t slavishly stick to an even mix of question types. If you are struggling with logic games or reading comprehension questions more, work more of those sections in to your schedule so that you see faster improvements there. Your brain needs to see a lot of this stuff to start making new connections. Logic games particularly rewards studying it a lot, so have some days where you do games til your brain hurts. If you are still see letters and numbers whizzing around in your head when you go to bed, that’s a good indication that you were hitting games hard enough to that day. Throughout your study you should always check back over questions you got wrong and questions you got right but found difficult. Make sure you understand why you got them right. Perhaps around the midway point of your LSAT study would be a good time to hit a full simulated Prep-Test. You can start doing this sooner too if you think you have got to the point where it would be helpful (generally when you are completing most problems on time). I wouldn’t be crazy about simulating the precise conditions of test day just yet. Take a tiny breather in between sections with one longer break in between sections 3 and 4. Do borrow an older section that you may have skipped at some point so that you are doing a total of 5 sections (skip 4-5 pts in first two compilations so you have plenty of spare sections to mix in). Take your four best section scores so that your feel good about the score and are motivated to keep going, but also note what your scaled score would be on the actual numbered prep test that you took 4 sections from. I recommend doing about two full simulated prep tests a week from month one and two, and then upping it to three a week about two months in to your LSAT prep. By now, you are practically an LSAT machine. The last week is all about maintaining your skill while patching up any areas of weakness. Check out these ‘last minute’ LSAT tips for ways to make the final weeks count. By the last two weeks or so of your LSAT study, you will be hitting a full prep test most days depending on how much material you have left. This is critical to building the stamina you need to focus all the way through on test day. The further you progress doing these preptests, the more automatic it should feel to sit down and focus hard on them. Now is also the time to focus hard on making sure that your body and mind are in the best shape possible. This means eating and sleeping right as well as exercising. I’ve got a full write up on taking care of an LSAT machine (you) here. Remember to take a day off for rest on the last day before the LSAT. This is key to let your brain recharge so it is ready to attack the test. This LSAT study schedule is necessarily a little broad and has some built-in flexibility to allow tweaks. As such, you may have questions about what to do in your specific situation. Hit me up in the comments thread and I’ll be happy to help! We have a lot more detailed advice about how to attack specific sections (LR/LG/RC) on this site so be sure you browse these posts. Good luck! Hello, I planned on taking the October LSAT and applying to schools soon after to make it in before the early admission deadline because I know my 3.2 GPA isn’t exactly competitive so I thought this would give me a better chance to get into my top schools. But if I only do okay on the October LSAT and plan on taking it again in December… should I wait to apply until after December or will the schools also see my December scores before they make my decision? Don’t worry about whether you apply in October or December. It shouldn’t make much difference with things as they are (applications to law school are so far down numbers wise that there are plenty of spots open in December). 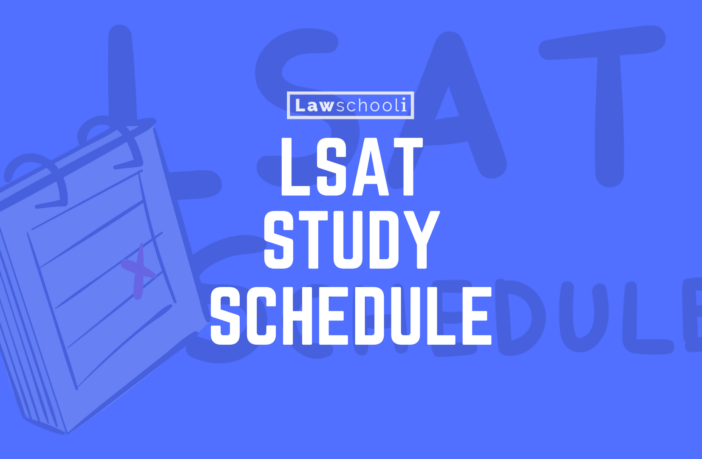 Focus on following this LSAT prep schedule and doing the best you can on the LSAT. When did you start studying for the October exam? Are you improving? Generally, you want to keep studying until then but cancel the exam and reschedule for December unless your practice scores are in the range you want already. I started studying July 9. I started with the Logic Games Bible and really improved and felt really good about it..missing only 1-2 questions in the entire section. I moved on to the Reading Comp Bible next and just recently finished the book but I feel like I didn’t improve at all..missing 2-5 questions in each passage so it has got me feeling not so good. Should I continue working on practicing reading comp or just go ahead and continue on to the Logical Reasoning Bible? Hi…I just started studying about a week and a half ago. I plan to take the LSAT in Oct, so I’m hoping I’m not starting too late. I just started taking a prep course class and was wondering if I still need to get the bibles? The class I’m in already comes with diagnostic tests and lesson books, is that all I need? Or should I also get the bibles? It is taking me so long just to get through the material assigned in class, that I’m wondering if I’ll even have time for the bibles. But if I should have them, I would like to know so that I can make time to incorporate them into my class study schedule. Thank you in advance! Chelsea, which prep course are you taking? Tell me both the company and the specific package you bought and I’ll take a look at what they give you to study. I’m taking the Test Masters prep course. They came with their own test masters lesson books and tests. Also, I was wondering if I started studying too late. I started studying last week and while I am doing about 6 hours a day, I still won’t have the full 3 months like you recommended. 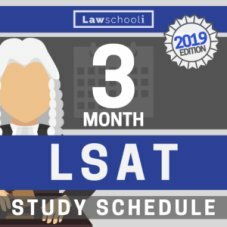 If not doing 3 months is bad, I was thinking I should then maybe take the Dec LSAT instead, but then that’d be 4 months of studying…do you think that is too much? I don’t want to burn myself out before I even get near the test date. Now might too early to decide whether you should delay until December. You still have a lot of time to improve (although you are getting a bit of a late start). If you are feeling able to commit to prep right now, keep at it following this schedule for a few weeks and see if you improve. If you don’t really see much improvement a month from now, then heavily consider delaying the test. I encourage you to consult us again at that time and we’ll be happy to provide advice based on where you are at. Best of luck! I’m taking my lsat this upcoming February. I am planning to self study and then take a class around December if I need it. Will this type of schedule work for me? I am a junior so I am going to have classes and such. I just wanted to take the lsat earlier than June so I can retake it in June, if needed, so I can begin to apply in the fall of 2014. Yep, this prep schedule should really be fine if you are in school. I did it while working full time (not more than 40 hours a week though). If you can, you may want to reduce club activities and other extra stuff, just so you don’t have too much going on to juggle with your schedule. Also, take a basic logic course this fall if you have some space for electives. That is good thinking taking the Feb LSAT and applying the following year. I think more people should take advantage of the February LSAT that way. I just tried to mimic the test conditions and take my cold diagnostics the best I could, even though I was more distracted that planned, I got a 140. Is it realistic to desire a 170? 152 happens to be exactly what Josh got on his cold diagnostic. Don’t worry about that- stick to a rigorous schedule and that score will be a distant memory. You have way more than enough time to register improvements. I haven’t looked at 7sages stuff, but they have a good reputation. If you do want to check out the powerscore stuff, just get the Logic Games Bible. I really think everyone should read it because it’s just that good. Otherwise, you appear to have a good study schedule worked out. Stick with it and expunge that diagnostic score from your mind for now. Feel free to do extra prep on top of whatever your company assigns you. I don’t know about 7Sage, but most companies don’t assign enough practice IMO. Evan here: there is definitely no reason to rebuy any prep questions you already got through the course. Ask them if they can provide a list of which preptests they got these extra questions from. That way you can get some more pts if you feel you need it (only buying preptests with questions they didn’t use). There is no harm in adding extra material to any LSAT prep schedule as long as you don’t get burnt out doing too much. Which company are you going with? A lot of the better ones have methods that are very similar to powerscores. As such, it may not be too too worth while to get the bibles. That said, I always think the logic games bible is worth a read, if only for the drills. Hi and thanks for the prompt response…I’m planning on going with 7sage… I plan to take the LSAT in December so I have some time till then…that is also necessary because I will be prepping along side work/study… my plan was to start mid August, finish the LSAT complete course which has video explanations and 6 prep tests (not time-bound) by the October 6th LSAT deadline, upgrade to the ultimate course which has more practice questions and 28 more tests and then, in the 2 months remaining, drill the what I learnt during my prep by doing the remaining tests time-bound, while referring back to the additional practice questions in order to reinforce the concepts that I fudged up on. As you suggested, I did take the diagnostic and scored horribly on the June 2007 pt with only my reading comprehension section going ‘somewhat’ ok (if that at all) with 20 out of 27 correct ..the LG and LR sections were a disaster and I ended up with a scaled score of 152. I’m kind of demoralized and right now wonder if this much time will be enough to register any improvement. Hi Josh…thanks for providing this schedule.. if Im going with an online prep course, would it still be advisable to do pick up the materials that you recommend…my course has all pretty much 50 hours of recorded lessons along with hundreds of questions per LSAT component type and 34 of the real LSAT prep tests available. My only reason for asking is that if I do go with the bibles, and the teaching methodology is different, I might get confused. best. @Stephanie it is totally fine if you are still studying the bibles for longer than 3 weeks. I will edit the schedule to make this more clear. Generally, I advocate running through them pretty quickly on the first pass and then returning to them as needed when you encounter problem types that you find difficult. I would do the LG and LR bible first before you do the RC. Best of luck and feel free to ask if you need any clarifications. Are the prep books from 2011- 2012 (latest on Amazon appears to be from December 2012), still going to be good resources/relevant for a test in 2014? Or should I plan to wait until the 2013 books are released and study from those? Everything on Amazon should be the newest edition. The Powerscore Logic Games Bible is the only one that has been updated recently, and the link here with bring you to the new revised edition. They will all be relevant, so you’re good to go! I’m on your three month studying plan because I found it easy to adapt to my own LSAT prep for the October LSAT. I am currently in the Step 2 section. I am in my first week and I’ve found that I am spending a lot of time with the logic games bible. I’m concerned that I won’t have enough time to spend on the other bible in the three week timeline so my question is, how much time would you recommend to spend on each bible (or LSAT section) in Step 2?